The Good, The Bad, and The Delicious is a segment dedicated to providing everyone with reviews on all their local and national eateries. On this installment of The Good, The Bad, and The Delicious. Your friendly neighborhood Seniors made our way to three of the most iconic pasta places in the St. Cloud area. We saw lots, ate lots, and consumed more pasta than humanly possible. Join us this week as we reminisce on our experiences at the three different pasta places we visited: Olive Garden, Noodles & Company, and Dimaggio’s. Olive Garden focuses and take pride in there reputation as a family restaurant. Okay, let me say something right off the bat. Olive Garden will always reign supreme. By now, you are probably aware that Olive Garden will win this comparison, but I’m here to tell you why. To start, it was super convenient and easy to order online and pay in person, which for me is a huge plus because sometimes you just need to get your pasta and go home to binge-watch El Internado for Spanish class. I ordered the lunch combos for $6.99 each and a drink totaling out at $14.79, which is not bad for what I got. 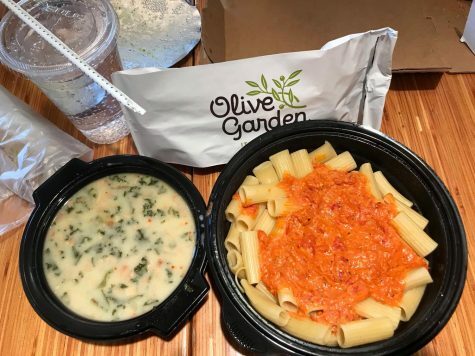 The closest to penne pasta that they had was rigatoni which was an experience all in itself, with the four cheese marinara sauce and Zuppa Toscana on the side with two breadsticks. Let me tell you this y’all, I have been craving this pasta ever since. 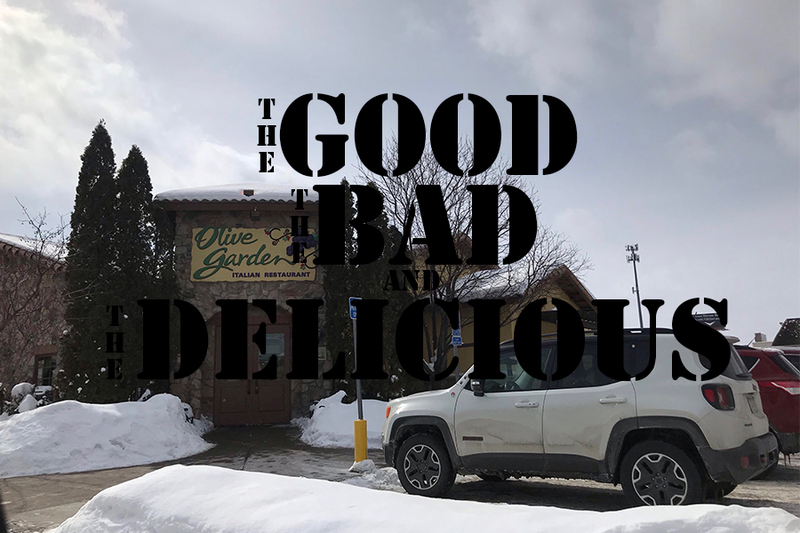 Olive Garden is the OG pasta place and cannot be topped I’m telling you right now, I will actually get some today (2 days later) after writing this because it’s been unbearable. It is the all-knowing being of pasta. We give Olive Garden a 6 out of 5 penne noodles. 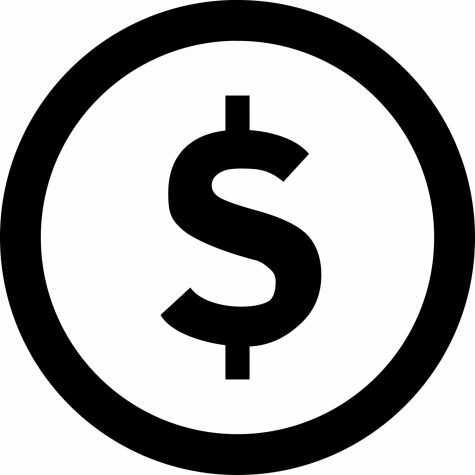 DiMaggio’s motto is “Locally Owned and Locally Loved” as a central Minnesota small business. If you’re out looking for a midnight meal, fueled by desperation and a strange craving for pasta, I would highly recommend DiMaggio’s. I don’t know where exactly DiMaggio’s stands for a Monday morning lunch, especially when compared to two pasta Giants™. 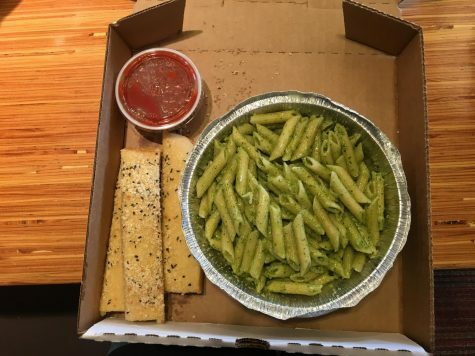 I ordered a Creamy Pesto Penne, a Pepsi, and four breadsticks. Now I will explain how vastly underprepared I was for the sheer amount of food I was about to receive. I walked into DiMaggio’s thinking that I had ordered a single serving of pesto, with a medium Pepsi fountain drink, all for a whopping $9.47. I will be the first to admit how naive this line of thinking was because what I received was anything but. I received a full two-liter of Pepsi with enough pasta to satisfy my craving for days to come. Soon I will resort to eating only pasta for all three meals. It is becoming an issue. The pasta itself was nice enough, but with a less than desirable after-effect. It was nicely seasoned and tasted okay with enough oil to soak through the bottom of the box and into the leather seats of my vehicle. The breadsticks, however, were nicely coated with a combination of parmesan cheese and Italian seasoning. I will also note how DiMaggio’s is located in possibly the scariest neighborhood in St. Cloud, and I did fear for my own health and safety. So overall, not a horrible experience. I would definitely recommend if you’re someone who is looking to go out of your way for some sub-par, sketchy, oily, pasta. DiMaggio’s would be the place to be. We gave DiMaggio’s a 2.5 out of 5 penne noodles. 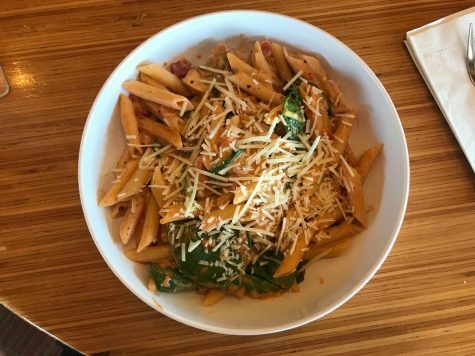 Noodles and Company’s menu features a large variety of pasta dishes from around the world. Noodles is an iconic noodle place, obviously. It’s in the name that they literally do solely noodles and it shows. I got the penne rosa with parmesan cheese and you know what, it was really good folks. However, I’m just gonna put it out there that it’s not all that it could be. Yes, I love a good penne pasta, but it’s really hit and miss for Noodles & Company this time. The flavors of this sauce with the authenticity in the preparation was truly heavenly. Noodles and Company will always have a spot in my heart but this time, it really let me down, but that will not stop me from enjoying my original pasta love. We gave Noodles and Company a 4 out of 5 penne noodles. All three restaurants are within 20 minutes of each other in the St. Cloud area.